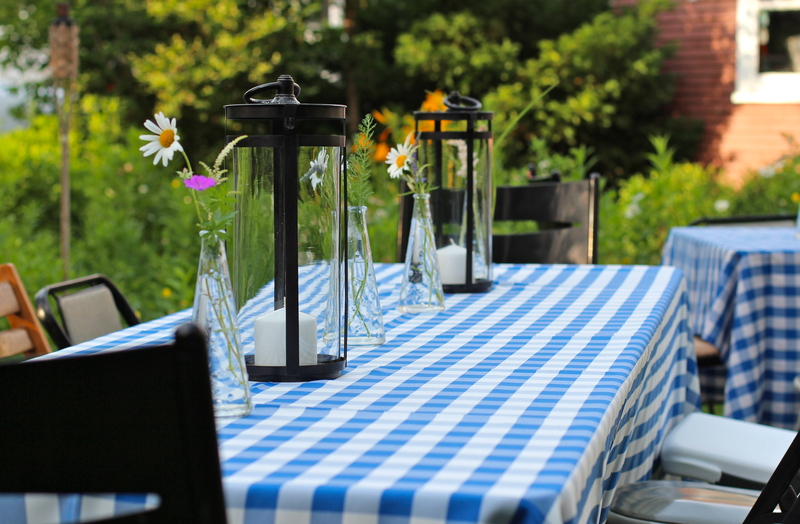 This summer party was a group effort – a beautiful backyard provided by our hosts, menu by A Global Garnish and food/drink contributions from all attendees. 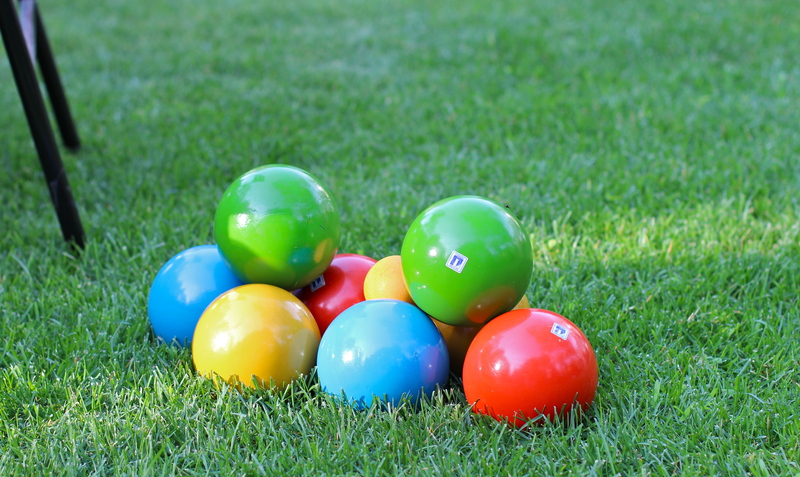 Don’t confuse this group effort with a potluck, which has the emphasis on luck. If you’re lucky, a potluck party will have a good distribution of appetizers, main dishes and desserts as well as a mix of ingredients/flavors. But why leave all this to chance?? If you give out menu assignments, you KNOW the final meal will all come together. Further, you save your guests the trouble of wondering: “what should I make?”. The group effort is what made this party so easy. Since the guests prepared most of the food, the hosts had time to focus on set-up. Their home and garden were both show-stoppers unembellished. But artful party additions and table arranging by the hosts made the final result even more inviting. The second main course recipe follows, an easy bone-less grilled chicken in a tangy beer-based marinade with ginger, lemon and mustard. One of the guests arrived with the marinated chicken, and our host took over the grilling once all the guests were settled in. The seasonal strawberry dessert is coming up in Part 3. For the complete menu, see Part 1. 1. Mix all ingredients except boneless chicken in an acid-resistant bowl (ceramic, glass or stainless). You may use any type of beer or ale, but I prefer a medium amber ale such as Bell’s (a Michigan brewery) as the color and flavor will carry through to the sauce. 2. Trim chicken. It is not necessary to pound chicken as the chicken will be angle-sliced for service so thick is better. 3. Place chicken in marinade. Marinate 4-8 hours, turning occasionally. 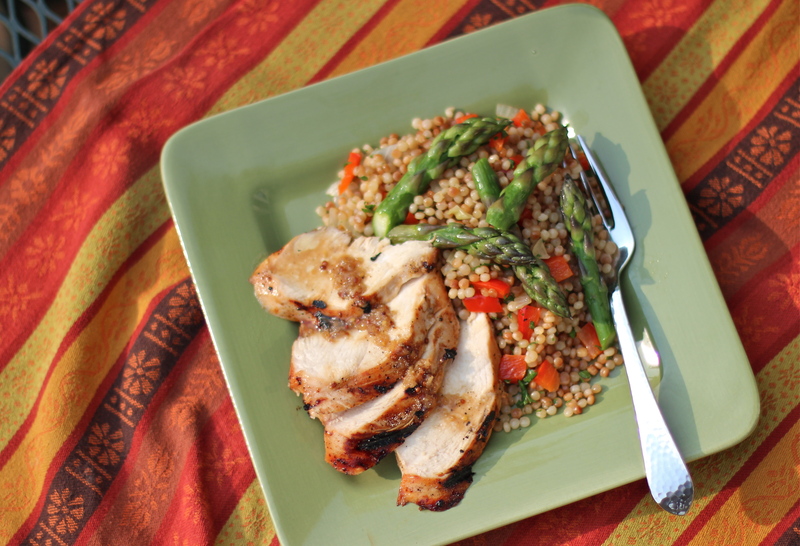 Remove chicken from marinade (reserving marinade) and grill chicken on a hot open grill. Turn chicken, let sear and then reduce heat (or move off direct heat for charcoal) and cover grill to cook through. While chicken is cooking, place marinade in small saucepan. Bring to a boil and reduce to a simmer. Cook until the marinade thickens slightly and adjust salt and pepper if needed. Angle-slice chicken, drizzle some sauce over chicken and serve remainder of the sauce on the side. 5. DO-AHEAD DIRECTIONS: This recipe is designed for advance preparation up to the grilling step, which is best done right at service time. If necessary, chicken can be grilled ahead, sauce prepared and both refrigerated separately. At service, reheat chicken in the oven in a sealed container with a bit of water or chicken broth, angle slice chicken and serve with heated sauce. This entry was posted in Country, Dinner Buffet, Mains, Menus, Recipes, United States and tagged Beer Marinated Grilled Chicken, Easy summer party by The Global Garnish Geek. Bookmark the permalink. The setting and the food were amazing. Thank you for organizing it all! You are most welcome, but the thanks go to our hosts for the idea of a summer party and the fabulous setting. What a beautiful setting and lovely menu! Thank you so much – delighted to hear that from the woman with so many gorgeous settings…. Can’t say I’ve ever had chicken marinaded nor cooked in ale before. Maybe the ale t’other side of pond is less like the ale/stout we have here. Not that I drink the stuff. Even the smell puts me off. However, the one and only time I’ve had beef cooked in Guinness was good. – What a lovely setting! What a nice setting for a party! Judging by the flowers peaking in the sangria photo, that garden must be beautiful. The marinade for the chicken sounds so flavorful and would make a tasty sauce for the grilled bird. I’m sure it was well-liked by everyone. Thanks John. Yes, having a great house/yard for a party is like starting a recipe with good ingredients. They made it easy. The house is as beautiful as the garden – as both owners are architects who remodeled themselves. Perhaps I’ll add some house photos in part 3…. 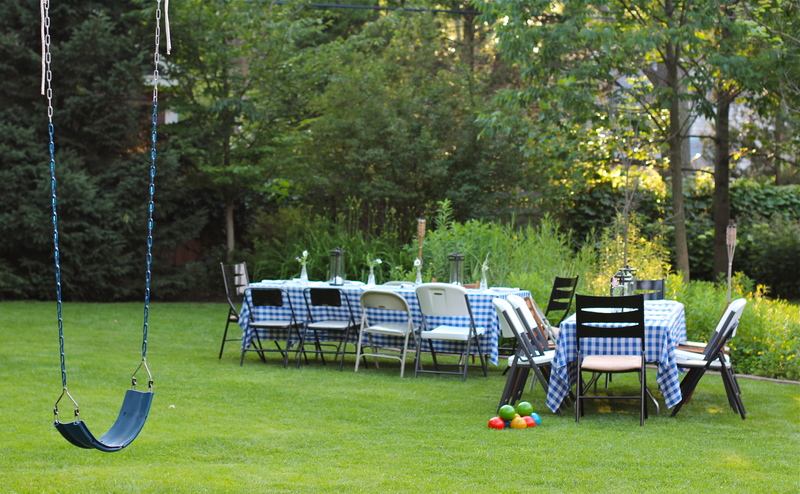 What a beautiful setting and a great idea for a summer party! The chicken sounds amazing but simple to make. I’m looking forward to part 3! Your pictures are amazing! And the food even more so…the flavors of the chicken come together so well, I can almost taste them as I read:) And I’m with you on potlucks, why leave it to luck and 20 appetizers, when you can assign a menu and take the guesswork out of it! Oh, what a nice thing to say Peri. I’ve been working hard on photos and sometimes I think I never quite reach my goals – so you made my day! Well then, you’re like me, your goals are lofty ones:) These pictures are more than stunning, each one tells a story and you’ve captured the moment perfectly! Oh, you missed this party, but we’d love to have you for the next one!! This is my kind of a summer get together. Same here – relaxed and easy. Looks like a beautiful day! Delicious, summery, and relaxing. Perfect! I love your little table cloths and decorations it makes it look like a festive event. 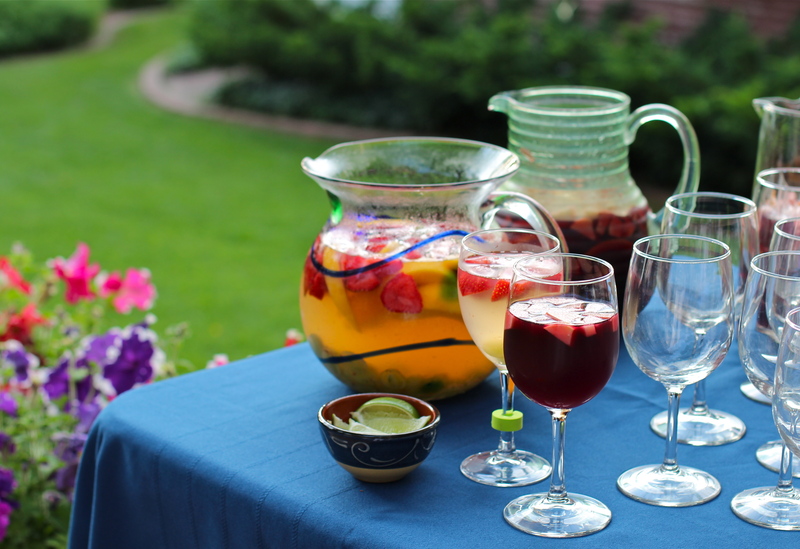 Sangrias and chicken on the grill sounds like a fun and light dinner for a gathering. Actually, my friend did the decorating but, thank you. I also thought it was a great setting…. Thanks Jess. It is oh-so-easy to make…. Great post and I love your tips. These pictures are gorgeous too. 🙂 Thank you so much for sharing and making our party planning much easier. Thank you. Glad it helped you out….